Kali 2.0 and the new aircrack-ng v1.2 RC2 has many new options but also has been throwing out strange errors. After reading through the forums I found a way to fix it with the following commands. Here are the commands to fix it. 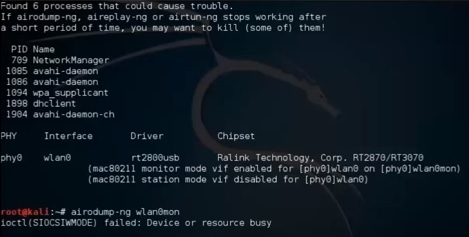 After running the above command “airodump-ng wlan0mon” should now work and go out and find AP points. I am still looking into a more permanent solution but this does work for now. Doesnt work for me, the processes involves causing trouble are network-manaer and WP SUPPLICANT. Never used to get this problem, such a pain. this did not fix issue for me! This is the exact problem i am having using virtual box…. however, i’m still getting no networks…. for some reason it works sometimes and doesnt work at others… i run all the standard processes and those mentioned and now i am getting no wifi points…. i have downlaoded and installed compat and that did the trick but something.. i dont know, between VB and KAli 2 maybe causing some error…. any ideas? Hi, did you find a permanent solution for this behavior? It is working for a single attack but if want to automate things it’s still a bummer. I haven’t looked into a permanent fix yet. When I have more time I will though, hopefully they come out with an update that fixes it. I have found that when using Windows 7, Vmware, Kali 1.0 and simply update to Aircrack-ng 1.2 the errors go away.